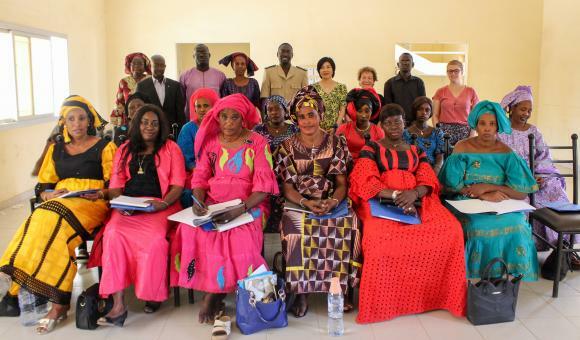 The Jigeen Ñi Tamit programme implemented in Senegal by APEFE (Association pour la Promotion de l'Education et de la Formation à l'Etranger - Belgian Association for the Promotion of Education and Training Abroad) supports women's companies in the Louga and Thiès regions and in the fruit, vegetable, milk and fish transformation sectors. 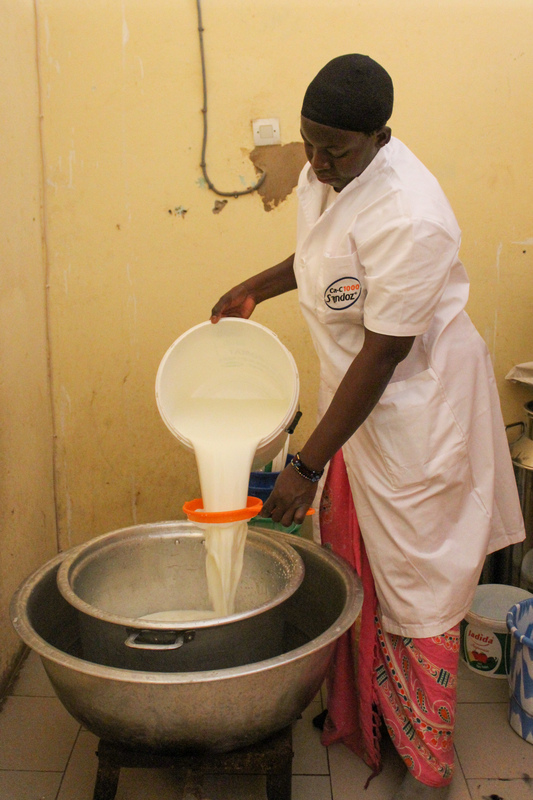 In the week from 18 to 22 March, the team for strengthening technical abilities visited Dahra, in Linguère department, to give training on hygiene best practices to beneficiaries working in milk transformation. Louga is one of the largest milk-producing regions in the country. On the first day, after the opening ceremony attended by the administrative and local authorities and the APEFE programme administrator, the training began. 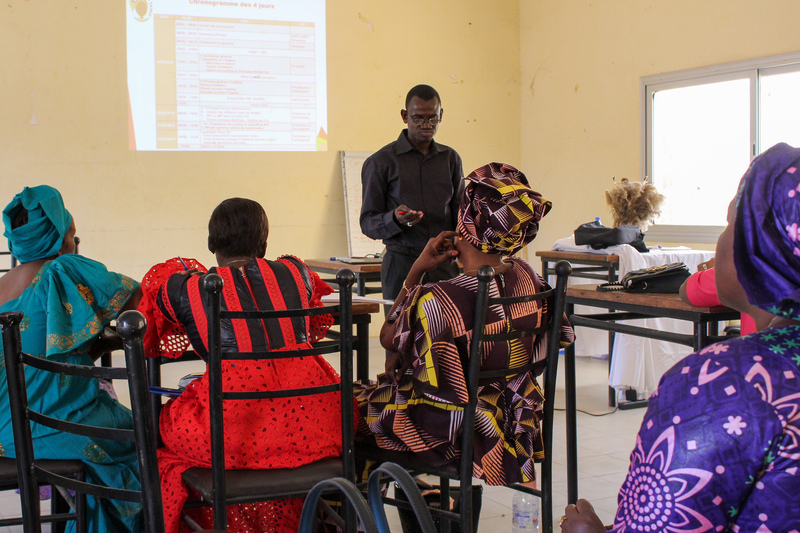 Each of the 16 beneficiaries expressed their expectations for the training and filled in a self-assessment chart of their knowledge, which would be used at the end of the training to measure what had been learnt. The training was comprehensive, with practical application of the theory taught. The aim was first to explain what hygiene is, to describe the different principles and then to apply these principles to milk transformation, specifically. The APEFE trainer provided all the accessories and tools to demonstrate their teaching to the participants. Wearing it themselves, the participants showed their colleagues the clothing required to meet hygiene standards and the order in which to put it on, how to ensure impeccable cleanliness using brooms and cloths, how to wash their hands to eliminate all bacteria, etc. 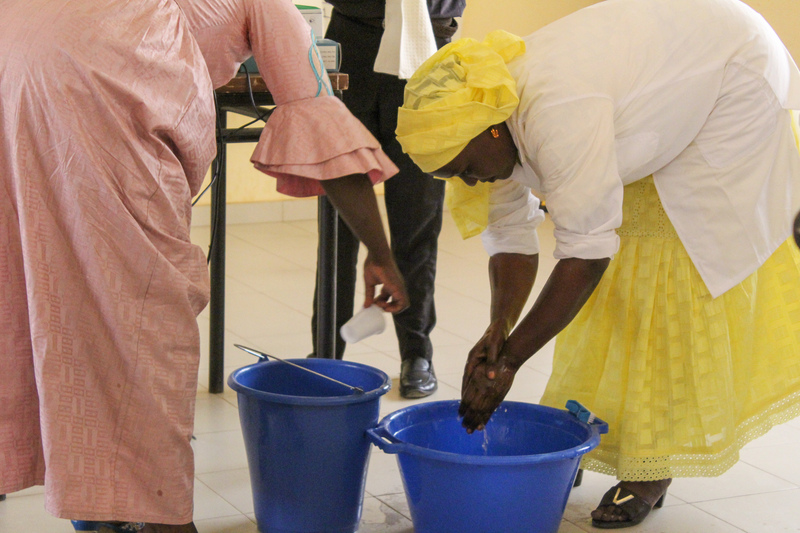 Several workshops were also organised to encourage the women to be more independent: the first on cleaning and disinfecting surfaces and equipment, the second focusing on the hygiene standards to observe at each stage of the pasteurised milk, curd and yoghurt transformation process. The women were very enthusiastic; most of them had followed many courses, but these were often limited to theory, with no opportunity for practical application. The week featured a visit to the Largal dairy in Dahra, which has a developed infrastructure. Once again this was an opportunity to put into practice the theory learnt during the training, such as “go forward", the concept for circulating products and people in a transformation unit. In groups of 4 or 5, the trainer guided the women through the dairy, ensuring that they were wearing appropriate clothing when they entered the building, and explained the circuit and hygiene standards to observe in a developed dairy. There is a specific path to follow, as each room has a specific function; for example the transformation room, which has several machines and heaters. For each room, Moussa recalled the rules and importance of “go forward” to avoid contamination. As most of the beneficiaries did not have this type of infrastructure but transformed a room at the back of their shop or their home, it was also an opportunity to see the infrastructure of a large dairy governed by defined construction and layout standards. After four whole days, the participants returned to their transformation units satisfied, full of new knowledge. They gave many thanks for this training which taught them so much, and above all to implement the hygiene best practices that they could now apply when transforming milk. The Liège site won out following an analysis based on 57 key criteria.